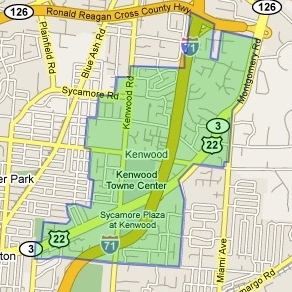 Kenwood is an unincorporated area of Sycamore Township. Sycamore Township was formed in 1803, and consisted of fertile hills, valleys, and thick forests. It served as an agricultural area throughout the 19th century. Many of the communities of the township grew in population, such as Sharonville, Reading, Deer Park, Amberley Village, Blue Ash, Glendale, Montgomery, and Evendale. Each of these eventually incorporated and withdrew from the township. After World War II, increased wealth, improvements in transportation, the development of highways in the 1950s, and the increasing availability of cars all spurred the movement of people from cities to suburbs. Business owners began to develop retail establishments to attract the new suburbanites. Kenwood is a subdivision that grew explosively after World War II, when developers moved in. Since that time, the Kenwood business area has been known for its shopping malls, office complexes, and national and international headquarters for many companies.